Story - 4: Much like last issue, the action, pacing, and general story are all interesting. I've come to really enjoy this book over the past ten months. With this latest issue, I think I've finally figured out what Yang is trying to say with both this book and this character. Here, Kenan decides against taking the easy way to gain his powers, and once that decision is made, the skeleton Superman from last issue is erased. According to Master I-Ching, that afterlife Superman was a physical embodiment of Kenan's temptation. Now, Kenan must gain his strength through hard work, training, and focusing his Qi. What Yang is saying through the stories of this character is that everyone has the potential to be like Superman if we just work hard to better ourselves. We have the potential, but the changes aren't going to happen overnight. Stepping away from analysis, I would have liked to see a bit more of Baixi and Deilan. Adding a second page would have made their appearance feel less like a mandatory insert to keep tabs on the other JLC members and more like a progression of that subplot. Perhaps I'm nitpicking, but the Baixi/Deilan bits in the past two issues have just really felt out of place. It was nice to see Superman and New Super-Man finally sit down and have a chat without worrying about saving the Supermen of the multiverse (see Multiplicity). I don't know how frequently these two characters are going to come in contact with each other, but there's definitely potential for some great mentoring moments between them. Art - 4: Bogdanovic does a great job as always. There are a lot of visually interesting panels in this book, and the design of the demons are imaginative. I do have a few small complaints, however. In the panel in which Superman flies Kenan home, Superman's eye is far from where a normal eye should be. It makes an otherwise perfect image look silly. Much like last issue, the American characters look like they were drawn by a Michael Turner wannabe. Cover Art - 3: What's going on with Kenan's face? Why the insistence to include the Flash of China? She was barely in the book. 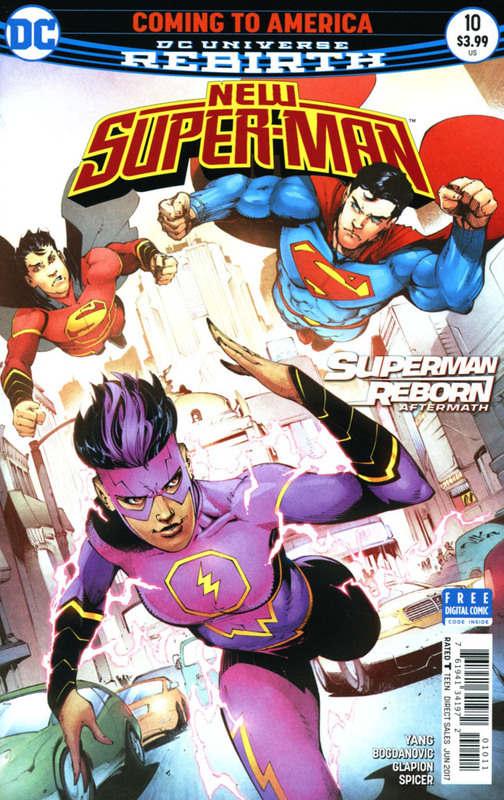 I think I would have preferred a cover that focused more on Kenan and Clark, especially since this is a Superman Reborn aftermath issue. 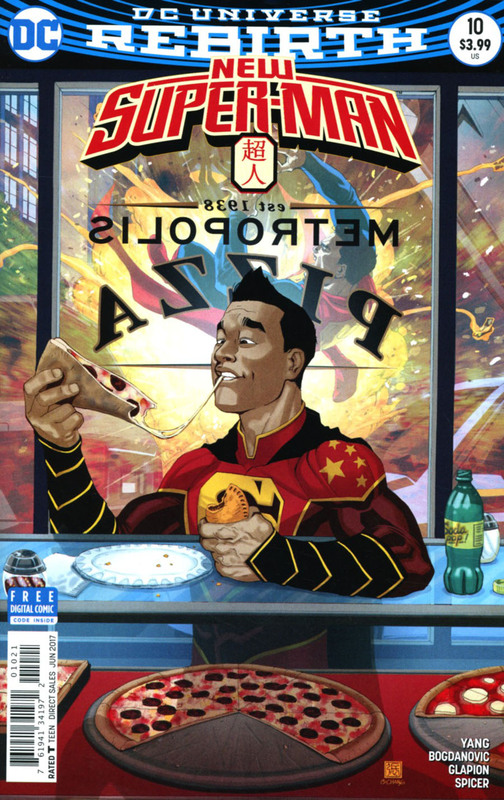 Variant Cover Art - 2: Kenan's face frightens me. I feel like Chang could have done better here.